In this image provided by the U.S. Navy, the guided-missile destroyer USS Porter launches a Tomahawk land attack missile in the Mediterranean Sea, April 7, 2017. For months, the U.S.-led coalition spearheading the fight against the Islamic State group has conducted a delicate detente, fighting in northern Syria while also turning a watchful eye on Syrian forces and Russian jets targeting the terrorist group. The U.S. cruise missile strike on a Syrian air base early Friday could change that equation, analysts say, and possibly affect the overall fight against the extremists as nonaligned forces jockey to oust IS from its de facto capital, Raqqa. "By conducting this attack, the Trump administration showed that the U.S. stance on the region is not going to be as before, and all regional players must be more watchful of what they are doing," said Janroj Keles, a London-based research fellow at Britain's Middlesex University. Bolstered by American airstrikes and advisers on the ground, the U.S.-backed, Kurdish-dominated Syrian Democratic Forces have been pushing IS southward, taking dozens of villages on the road to Raqqa. Sunni Arab and Turkmen militias allied with the SDF also made forays, along with a separate contingent of Turkish forces in what Ankara dubbed "Operation Euphrates Shield." Separately, mostly from the south, Syrian ground forces and warplanes from Russia have pounded IS strongholds, too. FILE - This frame grab from a video provided by the Syria Democratic Forces (SDF), shows fighters from the SDF opening fire on an Islamic State group's position, in Raqqa's eastern countryside, Syria, March 6, 2017. When conflicts arose between competing forces in the northern Syria town of Manbij after IS was ousted, quiet diplomacy involving commanders from Turkey, the U.S. and Russia hammered out a loose deal last month to restore peace. In buffer zones, U.S. Army Rangers have settled in not far from Russian soldiers, while local militias, Kurds and Turkish-backed forces keep to their areas. International forces fly flags to clearly delineate their identities and locations. Pentagon and U.S.-led coalition officials have said they do not work hand in hand with Syrian and Russian forces in fighting IS, though they admit to sometimes using a "deconfliction channel" to make Russian commanders aware of their military positions and intentions. After the U.S. missile strike, Russia said it was suspending use of the communications channel to coordinate aircraft movements in the skies over Syria, but the Pentagon said the lines remain open. 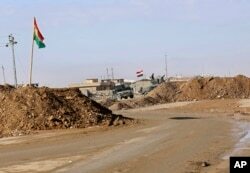 FILE - In this Dec. 3, 2016 photo, military vehicles guard an Iraqi Army checkpoint flying an Iraqi flag, center, next to a Kurdish checkpoint with a Kurdish flag, outside Irbil, northern Iraq. And while analysts say it remains uncertain how Russia and the U.S. will interact from now on concerning IS in Syria, U.S. officials have said they hope that the two sides' communication will improve as the battlefield narrows for the offensive on Raqqa. U.S Secretary of State Rex Tillerson is heading to Moscow in the week ahead to meet his Russian counterpart, Sergei Lavrov, with whom he already has been in frequent contact by telephone. And while Washington is willing to work with Moscow in areas of practical cooperation, such as battling against IS, the U.S. says it is committed to holding Russia accountable when international norms are violated. Some analysts say the U.S. has become too comfortable with the idea of coexistence with Syrian and Russian forces in the IS fight in northern Syria. "To undermine Islamic State's abilities to pose as a threat to global security, the Trump administration must more aggressively work to deny [IS] territorial holdings," said Michael S. Smith II, a terrorism analyst. "To achieve this, the U.S. does not require support from Syria or Russia; and we should not trust that Russia really shares the agenda of defeating the Islamic State, as a Middle East in turmoil benefits Russia's energy markets-dependent economy." SDF commanders in northern Syria predict that after some posturing, the U.S. and Russia will not deviate from prior commitments to wipe out IS in Syria and Iraq. FILE - A man breathes through an oxygen mask as another one receives treatments, after what rescue workers described as a suspected gas attack in the town of Khan Sheikhoun in rebel-held Idlib, Syria, April 4, 2017. "The de facto cooperation shall continue in the fight against IS between Americans and Russians as before," said Nasser Haj Mansour, an official with Syrian Democratic Forces. The U.S. airstrike "will help the war on IS because it shows seriousness from the Trump administration in dealing with IS and solving the crisis in Syria," he said. Some analysts say the U.S. strike was not meant as an overarching message to Syria, but to deliver a warning to Damascus to stop using chemical weapons. As for the continuing battle between the Syrian regime and rebels, Jonathan Schanzer, vice president of research at the Foundation for Defense of Democracies, said: "The impact of the one strike I don't think has changed the course of the Syrian civil war in any material way. I don't think it has changed the balance of power in Syria." Schanzer said the U.S. now has an opportunity to work on two fronts, and "the hope is that this administration will pursue a two-track approach to Syria." "It is not sufficient to simply remove IS, nor is it sufficient to simply remove Assad," he said. "A well-reasoned approach would attempt to excise both from Syria. That is likely the only way we can reach what I would call a soft landing in the Syrian civil war." Former U.S. State Department spokesman P.J. Crowley told VOA the White House will be very reluctant to get embroiled in Syria's conflict. "President Trump was elected to fix problems in America," Crowley said. "He was not elected to fix problems in Syria. And that's why the White House is obviously signaling that, notwithstanding the president's willingness to take military action, he is going to continue to be very skeptical about getting the United States deeply involved in a civil war for which there is no military solution." VOA's Ahed Al Hendi, William Gallo and Dakhil Elias contributed to this report.